Oh my goodness. 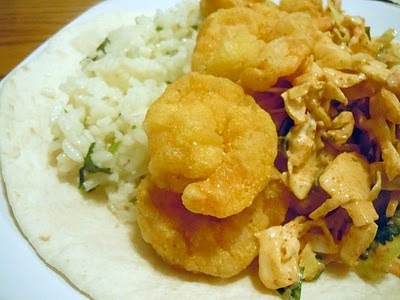 Please try these shrimp tacos tonight. The cilantro lime rice gives it a little tang and zestiness. The chipotle slaw gives it some kick and is a cool contrast to the hot shrimp and rice. The fried shrimp are juicy and crisp with the perfect amount of seasoning. The combination here is amazing. Way more than what I was expecting. I thought they'd be normal shrimp tacos, but I was wrong. The slaw is genius. The chipotle spice blend I used made it super spicy, but when paired with the rice and the shrimp, it makes a great combination. You can also grill the shrimp if you decide to do that whole healthy thing. I, on the other hand, like to live dangerously. But I'm sure it's great either way. You really can't go wrong with this meal. Oh, and like always, I used fat-free or reduced-fat ingredients wherever I could. Still turned out great! In a medium bowl, combine all of the ingredients. Mix well, then taste and adjust the seasoning, as needed. Refrigerate for about 1 hour. In a deep-fryer or heavy-bottomed pot, heat enough canola oil to come halfway up the sides of the pot, to 360 degrees F.
In a medium bowl, combine the flour and cornmeal; set aside. Season the shrimp with the adobo. Dredge the seasoned shrimp in the cornmeal mixture, making sure to get rid of all the excess (using a strainer works best.) Add the shrimp to the hot oil 1 at a time. Fry until golden brown, about 3 minutes. Remove the shrimp from the oil and drain on paper towels. Heat a medium saute pan over medium-high heat. Add a tortilla, and heat for about 30 seconds on each side (or heat in the microwave between two damp paper towels for 45 seconds). 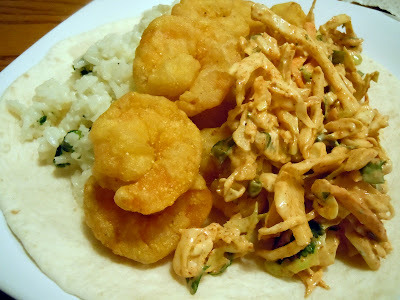 Spoon about 2 tablespoons of slaw in the center of the tortilla, then put 4 or 5 fried shrimp on top and fold like a taco. Repeat with the remaining ingredients. You can also serve it with Cilantro Lime Rice. Serve hot or at room temperature. These look delicious and I love the idea of adding the cilantro lime rice!